Middle Eastern Christians decry how Western media misrepresent the increasingly violent events in Syria. Now that Syria is in shambles—with an estimated 93,000 dead, 1.5 million refugees, and 4.5 million internally displaced; ancient churches torched, destroyed, or vandalized; Christians targeted for murder and kidnapping and even used as human shields—now the mainstream media is starting to admit that, yes, the rebel forces appear to include quite a few Islamist guerrillas. Now that even chemical warfare has made its appearance, with Carla Del Ponte, a member of the International Commission of Inquiry on Syria, confirming that “the chemical weapons are being used by the rebels, not the men faithful to Bashar al Assad”; now that clergy are being kidnapped, with still no word of kidnapped bishops Yohanna Ibrahim and Boulos Yazigi and with the beheading of a cleric by Islamist rebels available on YouTube for all to see—now the London-based Syrian Observatory for Human Rights has started including some jihadist rebel atrocities in their reports. Now that women are having to cover up with the abaya, or at least keep a veil handy when they venture out, just in case (something previously inconceivable in Syria), now the press is reporting the establishment of sharia courts which, according to the Washington Post, pass sentences “daily and indiscriminately” on Christians and anyone else who violates precepts of Wahhabi Islam. Syrian culture used to be distinctive among the lands of the Middle East for a coexistence between Christians and Muslims which went beyond mere tolerant forbearance, a reality of which Syrians were proud. Under the iron fist of the ruling Alawite dictators, who kept fundamentalists at bay, a good degree of religious freedom was preserved. Christians fleeing persecution in other Middle East countries found refuge in Assad’s Syria, including Iraqi Catholics fleeing post-Saddam persecution. Yet today, after two years of “Arab Spring” rebellion, the 2,000-year-old community of Assyrian Christians—some of whom still pray in Jesus’ Aramaic tongue—is facing extinction, and the international media is complicit. Since 2011, mainstream Western media, along with Al-Jazeera, has produced a steady stream of reports on the brutal suppression of liberty by the regime of Bashar al-Assad, ignoring the fact that the regime had long ensured that Syria’s nearly 2.5 million Christians—who include members of some 10 different faith traditions—were guaranteed the same rights as the Islamic majority. If the Assad regime, rather than being toppled, has become more popular with the passing of time and in the face of escalating violence, as many reports from the region indicate, it is because government tanks were the only thing standing between the people and sniper bullets from—or potential kidnapping by—rebel forces. Nonetheless, as late as June—while the Vatican news agency Fides reported that the armed opposition was forcing Christians to leave the country, and PIME news agency AsiaNews identified Saudi Arabia and Qatar as the prime instigators of this move—the New York Times’ reporting on Syria persevered in laying the blame for the nation’s troubles largely upon on Assad and his supporters. Yet Catholic authorities and Christian patriarchs of the different religious traditions in Syria have spoken up whenever possible. “Eighty percent of the population is on the side of the government, like all Christians are,” was the assessment, months back, of the Catholic Chaldean bishop of Aleppo, Antoine Audo, SJ, one of the many to accuse the mainstream media, including the BBC, of slanted reporting. In June 2011 pro-government civilians carried a 60-foot wide, one-and-a-half-mile long Syrian flag through the streets of Damascus, hoping their demonstration would leave no uncertainty as to where the population stood, and that accounts of vast popular indignation against the government would be belied by the turnout. However, initial reports on the demonstration described it as being against the government rather than for it. To the camera a crowd is a crowd, their words are in Arabic, and any signs in English can be excised or spoken over. In June 2012, the chief correspondent for Britain’s Channel 4, Alex Thomson, reported that his crew was led by the anti-government rebels into a sure ambush in “no-man’s land.” Why? Because their deaths by gunfire from government forces would have backed up the rebels’ accusations against the regime. “Dead journos are bad for Damascus,” Thomson pointed out. A well-known religious figure who has spoken out on the plight of Syrian Christians is Carmelite nun Mother Agnès-Mariam de la Croix. Of Lebanese origin, Mother Agnès-Mariam, 60, is the superior of a convent near Qara, about 50 miles from Damascus. In June 2012 she was warned of a plot to abduct her after she revealed that about 80,000 Christians had been “cleared out” of their homes in Homs province by rebel forces, and forced to flee the country. After the uprising began, Mother Agnès said she had noticed growing numbers of “aggressive, armed gangs which wished to paralyze community life, abducting people, beheading, bringing terror even to schools.” Slowly these gangs were identified: some were al-Qaeda recruits and affiliates, some had been involved with the Muslim Brotherhood, some were attached to other Islamist factions. “Only about one in 20 of these fighters is Syrian,” Mother Agnès said in an interview with The Australian. The rest come from places ranging from Britain to Pakistan, from Chechnya to Indonesia, from Albania to North Africa, many fought in Iraq, some also in Afghanistan. 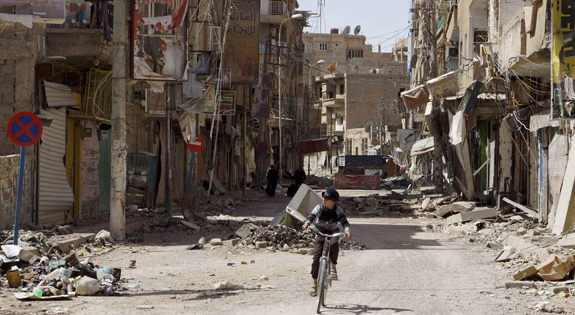 “Now their cause is being recycled to kill Syrians,” Mother Agnès said. By all accounts, while many people are suffering and dying in the Syrian conflict, no group is suffering more than Christians, stranded in the middle of a brutal war in which each side—rebel and regime—fires rockets into civilian areas and carries out attacks on a daily basis. Christians, peaceful and without anyone to protect them, are the first to be persecuted and harassed into leaving Syria. According to a report from last December of the UN Human Right Council’s Commission of Inquiry on Syria, although no religious community has been spared suffering, it is the Christians who face an “existential threat.” And in contrast to Syria’s Alawites, Shiites, and Sunnis, Syria’s ancient Christian community has no tribal system and no foreign power to defend it. Afghanistan, that country’s last remaining church, in Kabul, was razed in 2010 after its 99-year lease was cancelled. The US State Department knew of this, and even reported on it in September 2011, but no US official took any measure to stop or reverse it. The destruction of Afghanistan’s last church did not draw the international protest that accompanied the Taliban’s destruction of the Bamiyan Buddhist statues in 2001, but it is equally emblematic and even more consequential, depriving a religious community of its only house of worship. While the American people supported President Karzai’s government, financially and militarily, Afghanistan joined the infamous company of hardline Saudi Arabia as a country that will not tolerate any churches. America’s own diplomats and contract workers in Afghanistan must now hide their worship services. Other examples include Iraq in 2005-2008, when Christians, Mandaeans, and Yezidis experienced persecutions that ultimately led to a nationwide “religious cleansing” campaign against non-Muslims,under the noses of the US occupying power and more than 100,000 American troops. American foreign policy officials apparently believed that it would constitute “special pleading” to do anything to help when 20,000 Christians were violently driven from Baghdad by Islamists in 2006. Yet by then the US was involved “in intensive efforts to ensure that nonviolent Sunnis gained positions in the Iraqi government, which, thanks to the overthrow of Saddam Hussein, was run largely by Shias, whom the administration had helped politically strengthen and unify,” according to Shea. With these precedents, there is no use expecting a reaction to the July 2 report from Vatican news agency Fides that the jihadi faction known as Jabhat al-Nusra (which has heavily infiltrated the rebel forces in the area of the Latin Church of Saint Anthony, near Aleppo, where Father Francois Murad was murdered), have declared as their sole objective the establishment of an Islamic Caliphate, under which the law will not allow even the mere presence of “kafir” (“infidels,” or, in other words, non-Muslims).